The extraction is not needed, if you use the actual driver packages linked within the first post of this thread. Furthermore I will keep the download links up-to-date. Thanks for your help. Since I was getting the Unknown.sys cannot copy during install, I found a floppy drive and thought I'd try it the "old fashioned" way to see if that would even work, instead of slipstreaming the file. I get the same error "cannont copy Unknown.sys" even when using the floppy method. When doing the floppy method, you don't have any options of textmode or INF drivers. I have a Dell XPS 410, so I went to Dell's support page, downloaded the SATA exe driver for my computer, extracted it to the floppy. When I hit F6, and loaded the floppy, there were only four options, two were for mobile, the other two only one of which worked, and it was the one for my controller. I still got the same error with this method. Switching over to regular IDE (not needing to load the SATA drivers) installs fine. So, this is definately something to do with these drivers, just can't figure out what. I need to install in AHCI mode not regular IDE though because my other HD that has Vista only works in AHCI mode, and I will eventually be dual booting. Since I was getting the Unknown.sys cannot copy during install, I found a floppy drive and thought I'd try it the "old fashioned" way to see if that would even work, instead of slipstreaming the file. If you haven chosen the "Unattended Install", you should not hit F6. Have you tried to enable all possible AHCI Controllers while integrating the Intel textmode drivers with nLite? I understand you do not hit F6 while using a slipsreamed disc because the drivers load automatically. I don't think I wrote it clearly the first time. When I could not get it to work using the slipsreamed, I backed up and used a NON slipsreamed disc and installed a floppy to load the drivers off the floppy to see if that would work. Doing it this way, of course, I DO hit F6 to install the drivers, however, I was still getting the "cannot copy Unknown.sys" error. As for the drivers I picked off of the floppy, there were only four of them available. Two had a (mobile) in the name, so I skipped them and I tried the other two. One of them did not work at all. I tried again with the last one, and was able to recognize the drive, copy the files, then it got to the unkown.sys that it couldn't copy. I have searched all over the Dell forums, and others have had to slipsream the drivers or use a floppy, but none have had this .sys file that could not copy. I am not giving up though. Going to keep trying different things and will let you know what works. Your story about the "unknown.sys" file is very strange, because there is no such file within any Intel driver package. If you slipstream the Intel textmode drivers exactly the way I have layed down within my first post, you will succeed (unless you have another problem within yóur system). Maybe you should do a google search for "unknown.sys" to find out the real reason for your trouble. 6. Use the other options of nLite, if you want. 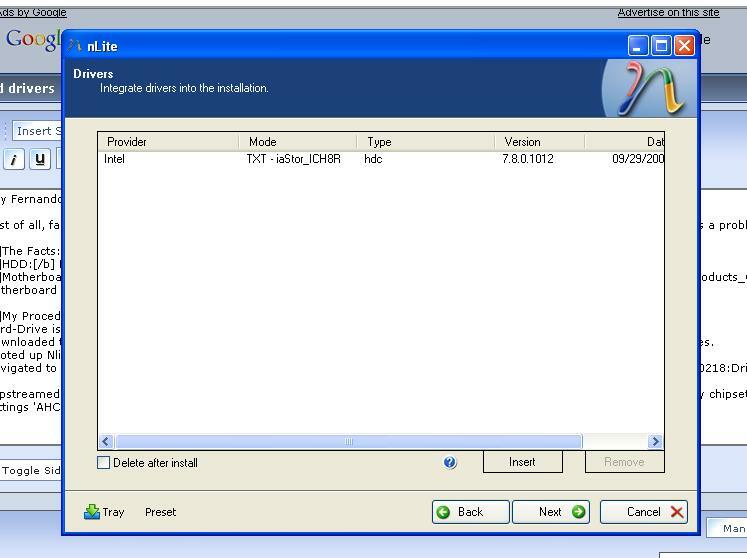 It is a good idea to additionally integrate the Intel INF files drivers named Intel® Chipset Device Software as normal device (=PnP) driver. You can download these INF drivers here. Please explain the step 6. The Intel INF drivers is a archive .EXE. How can integrate this Intel INF drivers? You have to extract it twice by using a tool like WinRar or 7-zip. 1. Extract the whole EXE archive. 2. Extract the EXE archive again you will find after having done step 1. 3. Pick any INF file you find within the folder named "All". I will add this into my guide or pre-extract the package and link to it. Both is better. I think. Thanks for your help, again. 1. 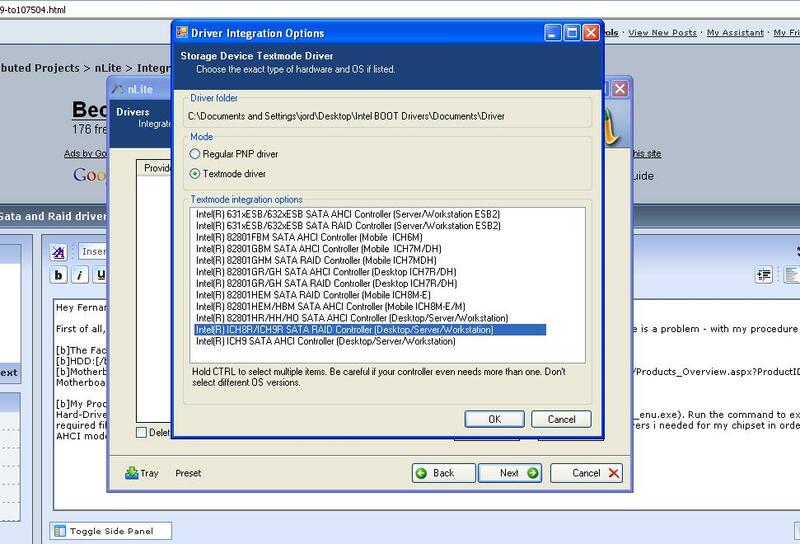 Nlite recommends removing the SCSI/RAID drivers from XP when integrating other drivers. Shouldn't this be added to the guide, or isn't it really necessary? 2. Likewise with the Intel chipset drivers: Should the original XP drivers be removed after integrating these? In case of yes, what should be removed? Because it doesn't seem there's an easy way to remove chipset drivers with Nlite like there is with the SCSI/RAID drivers. And a suggestion: Instead of extracting the Chipset drivers twice from Intels exe file, just get the zip file instead. Much easier to add the drivers from that one, I think. Thank you for your guide. And thanks to nuhi for a great app. 1. You can let nLite remove the SCSI/RAID drivers (to save some space on your hdd and time during the textmode part of the Windows Setup), but this is not really necessary. 2. You should not remove the original MS IDE drivers, because you may need them for your native IDE devices (CD-ROM/DVD). Thanks for your suggestion regarding the Intel INF chipset driver package. I have modified my guide regarding this point. First of all, fantastic guide! I've been looking for a specific AHCI Intel Slipstream guide for ages. However, as always, there is a problem - with my procedure. HDD: New Western Digital 500GB SATA2 HDD. Motherboard: Gigabyte 965P DS3 - (G965 Express Chipset) Motherboard Specs/Manual/Drivers etc. Hard-Drive is plugged into the Intel Controller ports (Orange). Downloaded the 'Intel Matrix Storage Manager' (File: iata78_enu.exe). Run the '-a -a -p' command to extract the required files. Booted up Nlite and hit 'Integrate > Drivers'. Hit next and slipstreamed my Windows XP Professional Service Pack 2 CD with what those drivers. Set Bios settings 'AHCI MODE - Enabled' and 'Onboard SATA/IDE Ctrl Mode - AHCI'. Get to XP setup ''No hard disk detected''. Did i slipstream the right drivers? My board is ICH8, however, i have found on Google people stating that Intel themselves said these are AHCI compatible and run under the ICH8R controller? Can someone confirm this? It would have been easier just to take the small driver package I have linked to within my guide. No, you slipstreamed the wrong SATA RAID and not the needed SATA AHCI Controller (just 1 position above the one you enabled). The ICH8 Controller will be detected by Windows Setup, if you integrate the needed Intel textmode driver for the ICH8 SATA AHCI Controller. You didn't enable the needed AHCI Controller, because you don't have a RAID array. Your driver package is on Rapidshare! Which means i would have to wait 128 minutes from the time i encountered this guide. The Intel drivers i extracted before i encountered your guide, i googled your guide after my initial attempt failed! Right!! Oki doki, so, all i need to do is click the HH/HO AHCI controller above the one i had originally selected and slipstream this into the XP installation instead? It was just a matter of me selecting the wrong driver? Furthermore, are those drivers in my picture the correct drivers to work with my ICH8 controller, did i extract and use the right ones under 'Mode - TXT'? You only have to wait a few seconds unless you have used Rapidshare for a big download just before. It was just a matter of me selecting the wrong driver? Yes! The correct one for you is the one above the one you have enabled. By the way: I have written within my guide, that you should enable all listed Intel SATA Controllers, if you are not sure, which one of the listed Controller is the correct one. Furthermore, are those drivers in my picture the correct drivers to work with my ICH8 controller, did i extract and use the right ones under 'Mode - TXT'? Thankyou fernando! I will try this out as soon as possible. I'll let you know how i get on! Put it this way: If i don't come back within a few hours, it worked. On other hand, it may have failed. So! Just sit tight, and ill get back to you sometime in the future. P.S Why the hell isn't this guid STICKY'd!? It is godlike! Thanks again buddy, wish me luck.